The Stade de Suisse Wankdorf is a football stadium in Bern, Switzerland. As the second largest all-seater football stadium in Switzerland, Stade de Suisse Wankdorf currently serves as the home ground of the Swiss football team BSC Young Boys. It was also one of the venues used during the Euro 2008. The Stade de Suisse was built on the grounds of the former Wankdorf Stadium, which was demolished in 2001. The new stadium has a capacity of 32,000 spectators, all covered seats. Integrated into the roof are solar panels with a yearly production of 1,200,000 kWh. The stadium was officially opened on 30 July 2005, although the first match in the new stadium had already taken place on 16 July 2005. Young Boys played against Olympique Marseille and lost 2–3 with 14,000 spectators watching. The match was considered an "infrastructure test", which is why no more than 14,000 tickets were sold. The stadium was used by FC Thun for three Champions League home matches in 2005, and for one home match in the UEFA Cup Round of 32 in 2006. Bruce Springsteen performed at the stadium on 30 June 2009 as part of the Working on a Dream Tour in front of a sold out crowd of 36,538 people. AC/DC performed at the stadium on 8 June 2010 as part of their Black Ice World Tour. P!nk performed at the stadium on 10 July 2010 during The Funhouse Summer Carnival. Muse performed a sold-out show at the stadium on 15 June 2013 as part of their The 2nd Law World Tour. Bon Jovi performed at the stadium on 31 May 2006 during their Have a Nice Day Tour, in front of a sold out crowd of 38,762 people. The band performed at the stadium for the second time on 30 June 2013 during their Because We Can, in front of a sold out crowd of 28,868 people. Depeche Mode performed at the stadium on 7 June 2013 during their Delta Machine Tour, in front of a sold out crowd of 39,241 people. One Direction performed at the stadium on 4 July 2014 during their Where We Are Tour. A peculiar feature of the Stade de Suisse is the presence of a single, red seat (the other seats are black and yellow). This was the first seat installed at the stadium, on 20 January 2005, and the honour of unveiling it was given to former Young Boys player and manager Walter Eich. There are no tickets available for this seat; every game the seat is occupied by a notable personality, often with ties to Young Boys. 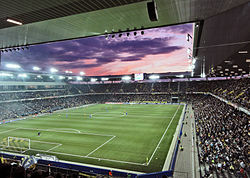 The Stade de Suisse with its artificial turf surface was an ideal candidate to provide Europe its first "new era" outdoor attendance record for ice hockey. On 14 January 2007, the massive local rivalry of SC Bern and SC Langnau managed to fill the Stade de Suisse with 30,076 fans, an event which was sold out within 53 hours of tickets going on sale. These two rivals regularly fill SC Bern's home venue Bern Arena with over 17,000 spectators. The stadium was one of the venues for the 2008 UEFA Euro. Wikimedia Commons has media related to Wankdorf Stadium.